published by D. J. Lake & Co.
numbers on the map is here. as a site for location the new Kentucky State Capitol? Read this. One of Northern Kentucky's very few Medal of Honor recipients was Petersburg's Charles Fleek. The citation is here. John Tanner Sr. was the white first man to settle in what is now Petersburg, and called the place Tanner's Landing. He likely didn't understand that his town was founded on the ruins of a Fort Ancient settlement from c. AD 1200. Tanner's Landing was probably never settled in any meaningful numbers, and Tanner's heirs sold 750 acres of the area to one John Grant, Daniel Boone's nephew, in 1806. Grant petitioned the Boone County Court to lay out a town called Caledonia. He ran out of money before the town was established. 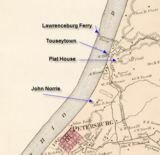 His son-in-law, John J. Flourney, inherited the land, platted it into a town, and named it Petersburg, in 1818. Tanner Jr. was kidnapped by Ojibwa Indians (Wikipedia), and spent most of his later life acculturated to the Indian life. That's him in the picture above. You can read his entire 400+ page book, A Narrative of the Captivity and Adventures of John Tanner: (U. S. Interpreter at the Saut de Ste. Marie,) During Thirty Years Residence Among the Indians in the Interior of North America, here (pdf). E. Y. Chapin's School Reminiscence is here. Arson in 1908 at the game warden's house,	here. Fire in Petersburg in 1893,	here. An account of the Petersburg High School Graduation exercise of 1908 is here. Street fighting in Petersburg, in 1879, here. Cockfighting on the river. (It escapes a lot of authority that way). The Kentucky Legislature refines the Petersburg charter of 1818 in 1838. Big robbery in Petersburg in 1866, here. Hanks shoots up a court, here. The Petersburg Race track announces it's 1833 spring opening, here.. A Williamstown correspondent describes Petersburg in 1870, here. “Petersburg, Ky., - The Boone County telephone Company will extend its lines to Bellevue and Rabbit Hash, where connection will be made with the Southern Indiana Association by cable under the Ohio River.” The American Telephone Journal, Vol.6, 1902. The Petersburg Cemetery history, here. Read about William Snyder's pet bear, here. Petersburg's Daniel Hewitt rode	with John Hunt Morgan, here. A glimpse of Petersburg, August 14, 1903, here. Wild man terrorizes Petersburg, here. Wild hog terrorizes Petersburg, here. Don't miss the saga of the end of the Petersburg Racing Association. Drinking and brawling were involved. Read it	here. and most importantly a ferry to Lawrenceburg. It was never an “official” town. the home of Petersburg's John Norris, whose exploits and feats are detailed here. The map above is an excerpt from the Lake Atlas of 1883. Jacob Wychoff Piatt's will contested “for alleged Jesuitical influences.” More here. We found this piece (pdf) discussing some Piatt slaves. “Petersburg, Ky. Dec. 17. Henry Robert, sent from this city to the Lakeland asylum 14 years go, escaped several weeks ago and was found by hunters in a cave near his home, weak from cold and hunger. He could not stand alone. He will be returned to the asylum.” From the Covington Courier, December 19, 1902. An 1873 correspondent to the Covington Journal describes Petersburg and gives a list of some early settlers. Read it here. Read Julia Stockton Dinsmore's Verses and Sonnets , a book of poetry from 1910, when she was 77, at Google Books, here. Stiker, at the Hebron Branch of the Boone County Library.